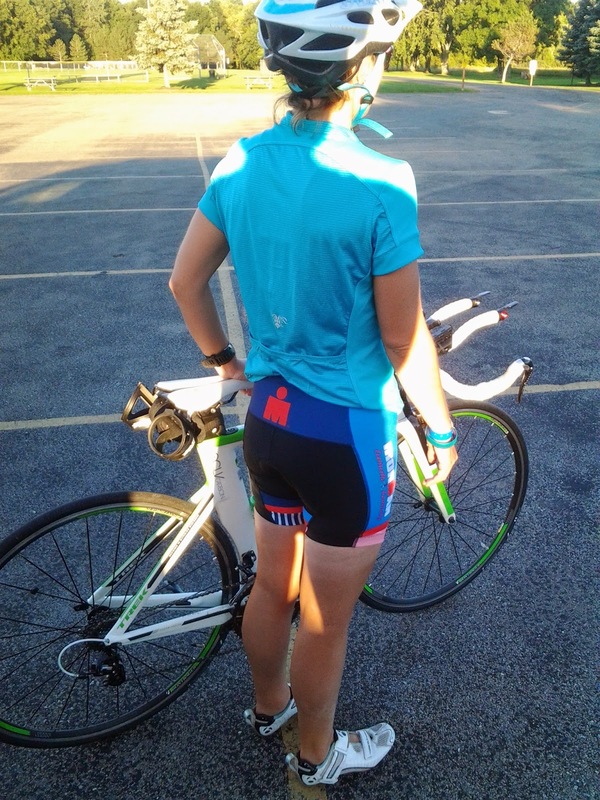 From Couch to Ironwoman: How am I Really Doing? After our Ironman, we spent the next day going to the Athlete's Village one more time to buy some official "Ironman" gear (it didn't feel right buying too many things prior to the race, so we bought most of our stuff after). Then we left town and our first Ironman experience was really over. I was relatively sore the next 2-3 days so it didn't really bother me that we weren't working out as much and that we were easing back in. Going back to work was a bit rough, because it meant that my summer was over. After a short 1 mile OWS race, with age group wins, the post-Ironman blues really started to set in. I feel like I am in a fog and I can't get out of it. Even the start of marathon training hasn't brought me out of it. Our runs are going really well and I thought yesterday that I felt better after a great early morning run, but then the feeling left me. I have cried a few times, for pretty much no reason other than I think about our Ironman, the training and all of the time that we put into it. I don't want to be sad about it, I want to be happy that we accomplished our goal and that now we can move on to bigger and better things. Unfortunately, there is always the part of me that worries that it will never be the same again. That I will never get that feeling again, and in all honesty I still haven't gotten the "I am amazing" post-Ironman feeling. I know that it is a big deal, we accomplished something that not many people can say that they have and we did it well. I never in a million years thought that I had a 13:20:28 first Ironman finishing time in me. I should be really proud of that fact. Some people just hope to finish, and others don't even finish what they started. I felt the same way after our first marathon, which did not go well, so I know that the post-Ironman blues will dissipate eventually. Mike and I have a lot of fun things coming up, a half marathon, a marathon and all of our triathlons next year. I'll just keep trying to get back to "normal" (I am far from normal) in whatever way that I can, and for now be alright with the fact that it is going to take some time. I know what you mean, I think I had the post IM blues for a few months, and it wasn't physical, but more mental. I did not care to train or anything for awhile and I let that be. Slowly it came back and now I am full sped ahead and looking for my second IM next year and hoping to beat my previous time, which I know will be sweeter! Full disclosure: I do not know what you're going through firsthand, but I know friends and teammates have experienced the same thing after their races. The training and the Ironman mentality becomes a huge part of your life for such a long time, so it's weird when it isn't like that anymore. Everyone copes with it differently: one guy gave up triathlon cold turkey (which I don't recommend! ;)), another continued to SBR for fun/without training, etc. Overall, though, it's important to do whatever you *feel* like doing--or not doing for that matter. I also love the honesty of this post. People don't talk about post-Ironman life as much as they should because there is a learning curve of sorts. You're awesome, Jamie! It was interesting to read your perspective. Because IM training was so intense and completely time consuming, I really did look forward to life after IM. When I got there, I definitely appreciated the freedom that it brought, but on the other hand, I did feel a bit lost. When 6-months of your life is basically dictated by a piece of paper (or an electronic file) called a training plan, it was hard to have the complete opposite. So, I can relate to some of the feelings that you shared. I thought about registering for late season races, but in the end, I did not. It did not take me too long to get past those antsy feelings, but I think I have. I have thought about next season and what goals/races I would like to plan. I have been able to participate in some group rides, etc that I was able to participate in during my training. They have been fun, but very challenging, because they are really pushing my speed (good thing). With my run, I have experienced some post-IM sluggishness. I am running some, but they have been tough. So, in a nutshell, it seems like a good thing that I did not register for another race, at this point. It sounds like you have not experienced any of these post-IM sluggishness, which is good, since you have other races/goals on your horizon. Our first IMs will always be special, no matter what we go on to do in the future. Hold on to all the good memories and continue to celebrate your accomplishment! Thanks for the great comment! I know that I will be alright in the end, and every day is a bit better, I just miss the training. We're still doing all three sports but with marathon training there's definitely more of an emphasis on running. I do enjoy the off season to do different things and luckily we have a lot of fun things planned for next year! Thank you for sharing your thoughts/feelings on this! I have never felt the way I felt after my first Marathon and every race since my second half seems to be just chasing that feeling. The more I accomplish sometimes, the more I feel like I hold myself to higher goals and the little day to day victories aren't celebrated. Sometimes I think you have to let yourself celebrate and enjoy small things - just getting back on your bike and gearing up for the marathon, that's huge! It's gotta be a big let down emotionally. It's really trite, but I always think of the very pinnable adage "don't cry because it's over, smile because it happened". It seems to fit here. You'll feel that way again! Thanks for being so honest! I think it's so hard to build up to such an event, that is in the end a one day thing - but it was your life and your goal for so long. You will get your energy back! It is super tough to go from something you work so hard for to it suddenly being over. Hoping you feel more back to normal soon.